I have an older (1987) motorhome and would like to replace the worn carpet. How is this carpet originally installed by the factory? How do I install the new carpet? I’m very handy, but I need to know the correct procedures. Chances are, Paul, the original carpet was simply stapled to an underlayment of plywood or pressboard. 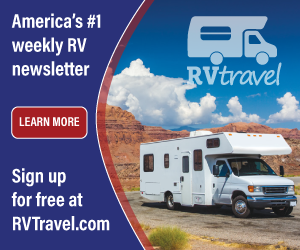 Keep in mind that during manufacture, some RV floors are fully carpeted before the partition walls, cabinets and furnishings are installed so it’s doubtful you’ll be able to remove every square inch. Complete removal is not always necessary, however, since the old carpet itself can be selectively retained in closets and under storage cabinets. If the existing carpet was installed before the cabinets and partition walls, carefully cut along the walls and cabinets with a sharp razor knife to cut out the old carpet. Save these pieces. They may be used as a pattern for the new carpet. Be sure to check the floor area carefully after removing the old carpet. Completely sweep the wood flooring clean and sand any rough areas. 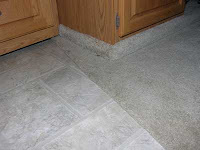 Cabinet doors that are low to the floor should also be removed for easier handling of the new carpet. If a thicker carpet and pad are going to be installed, some cabinet doors may have to be repositioned to accommodate the added thickness of the carpeting. In most cases, this is not a major concern, but I do recommend a thick carpet pad. Get a good one. As mentioned, any removed sections of the old carpet can be used as a pattern for cutting the new one but it is wise to leave a little extra material all the way around the perimeter and trim the pieces to fit exactly at the time of placement. A razor knife with a new blade works best for cutting virtually all carpet materials. Stock up on blades and change them often during the installation process. Use a metal straight edge whenever possible to produce a nice, crisp edge. After cutting the carpet to fit, lay it out flat inside the coach and work from one end of the motorhome to the other. Force the new carpet into the edges at the cabinets and carefully trim the remainder of the excess with a sharp razor knife. Since the area in the RV is relatively small, a carpet knee-kicker is usually not needed; just a decent staple gun. There are other means, but the stapler reigns supreme because it is fast and easy to use and the staples are easily concealed within the pile of the carpet. It is recommended that an electric or air-powered stapler be rented or otherwise obtained for the task of securing the carpeting. Double-faced carpet tape is also quite handy for attaching the carpet in close quarters or under cabinets where a stapler may not fit. 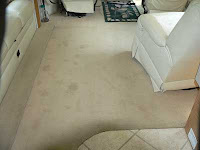 In most motorhomes, there is a point where the carpet meets linoleum, tile or a wooden section of the flooring. One transitional method is to simply fold the carpet under and staple it to the floor. When folding the carpet under, remove the woven backing from the carpeting first, then cut the pad back the width of the fold (about 2-inches or so), so that the folded carpet lays as flat as possible. There may be another preferred method for that style of carpeting such as a metal or wooden threshold molding. After the carpet has been stapled to the underlayment, remount any furnace ducts or cabinet doors that may have been removed prior to the installation. Keep in mind; it may be necessary to raise some cabinet doors to provide enough clearance above the carpet for the door to swing freely. When carpeting in the lavatory, it is best to remove the toilet completely and to allow the carpet to cover the floor all the way up to the perimeter of the floor flange. After installing the carpet, reinstall the toilet. Taking your time, double checking measurements and using a sharp razor knife will make the job of carpet replacement a fairly easy task. Additionally, a new carpet will reflect a personal touch that can be enjoyed for many, many miles. And it always adds to the trade-in value.